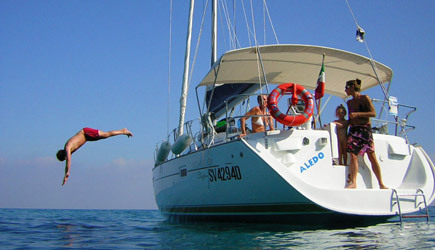 Aledo is a Beneteau Oceanis Clipper 423. "Aledo" è was chosen for the optimum balance between comfort and performance. 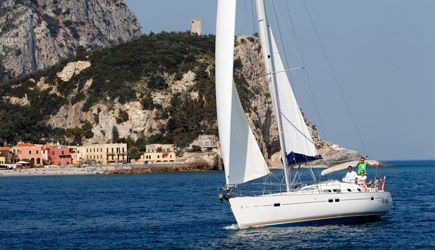 It is an ideal boat for cruises and holidays, but offers moments of great fun when sailing. It is robust and secure, with the best optional. We place great emphasis on sailing performance, providing it with extended mast, oversized winches, spinnaker of 120 square meters. and two headsails depending on the season. 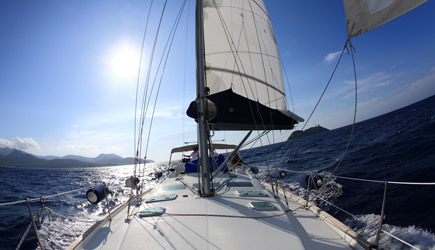 The sails are very important to us and are renewed frequently to ensure outstanding performance. The hull is repainted every year to provide low friction with water and allow us to run fast. We are always up to date on weather thanks to navtex. Always available 220v, even at anchor, thanks to the inverter. The heating Webasto makes it possible cruises out of season. Internet connection with computers on board when we are in Italy. Our philosophy is respect for the environment, so we use biodegradable products and the engine is used the minimum necessary. 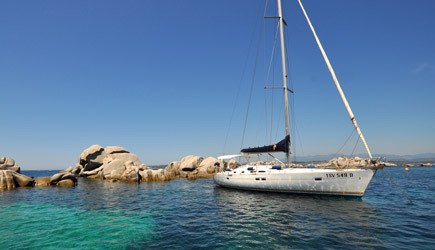 The dinghy with outboard 5 hp allows us to reach even the most remote bays.